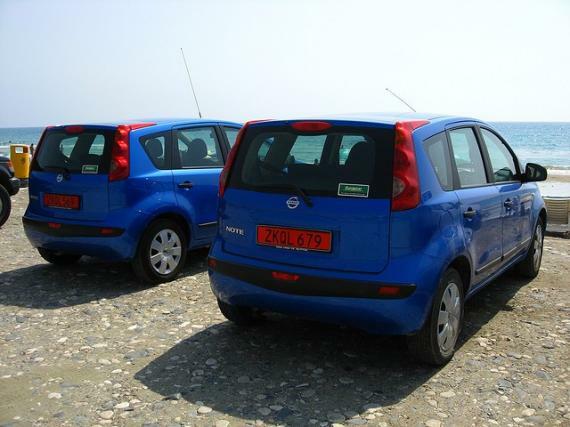 Car hire in Cyprus: How to rent a car and tips about driving. While there are several places to rent a car in Cyprus the best option is to rent the car directly at the Larnaca International Airport. The selection is much larger and you won't need to be transfered to the city, while the extra charge for the airport pickup is quite low. The rental companies are located at the basement of the airport building just after your exit from the customs control. The are many international rental companies available for renting a car but also a few local ones. Avis, SixT, Hertz, Budget and Europecar are the major players but there are also two local brands; Petsas and Astra car rental. All companies have several different insurances packages depending on the CDW (collision damage waiver) policy you would like to choose. GPS and child seats are available as well and you can choose between a variety of manual or automatic transmission cars. All the rental companies offer the rental car full of gas. However, some companies charge you for the initial fill-up and ask you to return the car empty. This is not a very wise choice especially for travellers who want to make only few kilometers on the island so they won't use the whole tank. Feel free to ask and verify the fuel policy before committing yourself to a rental agreement. There are a few things to keep in mind when driving in Cyprus. The first is that you have to drive on the left side of the road. All the cars are RHD (right hand drive) just like in the UK. If you are not used to driving on the left side of the road take extra care because it's difficult to estimate the distance between the car and any obstacle on your left side. If it's your first time and you have other passengers in the car, it's a good idea to ask them to remind you the driving directions. On the highway, the fast lane is the one on the right so keep driving left for a safe trip. The second very important aspect of driving in Cyprus is that it's forbidden to enter northern Cyprus with a rental car. If you do so, the insurance company won't cover the cost should anything bad happen. You will be reminded about this at the rental stand and it will also be written at the rental agreement. A last tip for those who are looking to visit mountain Troodos is to plan their trip carefully before leaving. While the distance is not that big, the road is quite difficult with a lot of curves. It's a long ride, but it's a trip worth doing if you have a car in Cyprus. Cyprus is not very big and you can travel from Paphos to Agia Napa in little less than 2 hours. Having a car while being on Cyprus is definitely suggested as you will manage to see more places in less time.